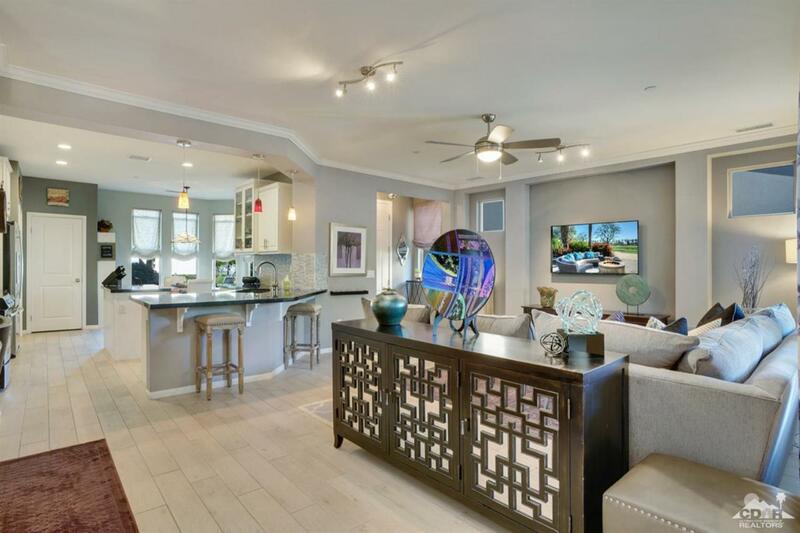 Sleek SOLAR Powered Monaco Model (2BR/2BA + Den/Office | 1,623 Sq. Ft.) with STYLE & CHARM on Quiet Interior Lot. Optimized great room living space with rich crown molding, warm white-washed wood tile flooring, natural gray walls and sophisticated lighting. Fully equipped kitchen featuring upgraded, stacked cabinetry, prep island with wine fridge, granite slab counters and accented backsplash. Multiple dining/entertaining options from cozy kitchen nook, casual bar seating or formal dining area overlooking great room. Nice bedroom separation between generous master suite and guest bedroom/bath. Flexible den/office/studio adjacent great room opens to covered patio with extended paver decking, lush landscaping with pops of color and mature shade trees. Priced to Sell & Move-In Ready...Don't Miss This Great Opportunity in Guard Gated Trilogy at the Polo Club. Discounted Membership Initiation for Resale: $1,500. HOA+Club Membership: $325/Month.